One of the North-east comedy trio Scotland the What? 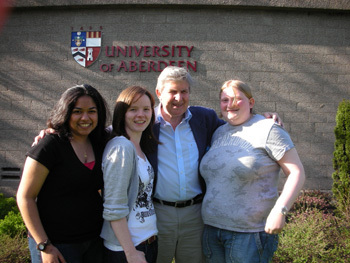 has been announced tonight as the new Rector of the University of Aberdeen. Stephen Robertson MBE takes over the three year tenure this July after being voted in by students. The current incumbent Robin Harper MSP steps down on June 30. The University of Aberdeen graduate stood against Aberdeenshire Councillor and plant ecologist Martin Ford, and local journalist and community worker Hamish Mackay. Mr Robertson polled 928 votes to Mr Ford's 852. Mr Mackay was eliminated after the first round of the Single Transferable Vote count. The new Rector-to-be said: "As a graduate of the University of Aberdeen I am absolutely delighted to have been voted in as Rector. Some people have greatness thrust upon them and today I had greatness thrust upon me!". The Scotland the What? trio met as students at the University and made their debut at the Edinburgh Fringe Festival in 1969. They retired after their final performance at His Majesty's Theatre Aberdeen in 1995 and were recently granted the Freedom of the City of Aberdeen. Mr Robertson was an active member of the student body, performing in the Student Show for five years and representing the University at squash. His dedication to student union activities culminated in his election as President of the Union Management Committee 1956/57.